People are more concerned about their health and fitness than before. They are taking the support of technology to get a right way of gaining better health. Most of the people are using Smartphones in which they have installed exercising apps. These applications work as your personal fitness guide. It means, now you don’t need to pay for a trainer, exercising applications can become your personal trainer. Whether it is running or any other exercise, if you don’t do it in a right way, you cannot gain desired benefits. By knowing this fact, marketing leading application development companies have offered some workout apps. Some of the most renowned applications are given below. As the name depicts, Six Pack Abs is the leading application that supports you in performing 20 different Ab exercises. This application offers you HD video suggestions for the exercises so that you can perform the exercise efficiently. Also to the training videos, you can also select the music you want to listen during exercising period. The basic version of this application offers 20 abs exercises. If you want more exercises of abs, you can upgrade the application and get more 50 abs exercises. Fitness conscious people are downloading this application and using it to get charming looking abs. Click Here To Get Six Pack Abs App. Available for both Android and iOS smartphones, this application is providing you’re a lot of free exercises. If you are using this application, you get audio and video instructions for the exercise. This application can help you in building athlete type body shape and gaining better stamina. Users not only get included exercises, but they also gain access to a vast exercise library of this application. It helps the user in setting routine exercises, and users can also share their exercising experience online with the community. Click Here To Get Workout Trainer App. Those, who are looking for tailored exercise routines, they must use FitStar application. It is an ultimate exercise training coach that gives exercises, according to the ability of the user. You can mention the type of exercise you want and FitStar will fetch out a right exercising routine for you. Users can learn much innovative exercise, which can help them in improving their overall look. Today, thousands of Smartphone users are doing exercises with the assistance of this application. Its features attract every fitness seeker towards it. Click Here To Get FitStar App. It is an ideal application for you if you are planning for weight loss. It offers you exercises, efficient enough for quick weight loss. You will get a chart of foods, which you have to eat for quick weight loss. Lose IT! has been serving people for many years. It has a community in which experts offer help to new candidates. You will get enough support of experts, and they will share their experiences of achieving the prime objective. Click Here To Get Lose It! App. 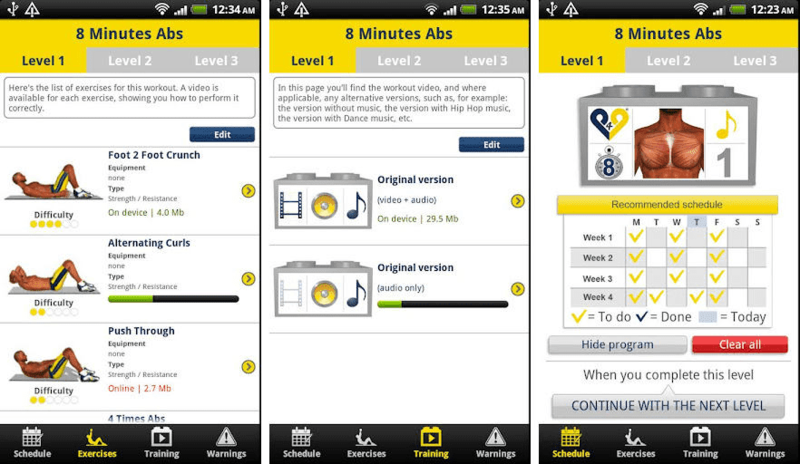 These best workout apps are playing a vital role in making people fit and fine.